Happy Wednesday! Sorry for my super brief post today but it's going to be a really busy morning at work. Hope you have a fabulous day and make sure to link-up with us below!! You are fall fabulous! I love the frayed hem jeans with booties! Such a cute look and what a beautiful jacket! Obsessed with these flares crop jeans!! So so cute and perfect with the bomber jacket! That jacket is the cutest, and I love it paired with those cropped jeans and fun ankle boots. I love this jacket! And it pairs so perfectly with those open toe ankle booties! Happy Wednesday, Kelly! So cute! I love that jacket! It looks very soft and comfortable. Perfect Fall outfit. Love this jacket on you. That jacket is perfect! I always love your outfits but this one is one of my favorites. Loving your jeans Kelly! the distressed and wide legs details are just perfect! Loving these jeans. Heart eyes at the flare and hi-low hem! 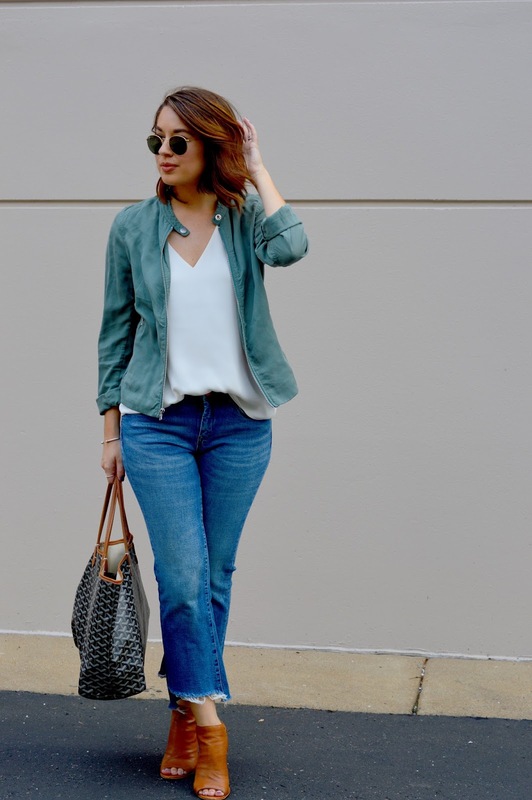 Love that utility jacket and pretty color. I love your teal moto jacket..so cute!! I'm so loving this style of pants! You look so fabulous! Have a great week! That outfit is so cute. I love the ripped or weathered detail at the bottom of those jeans. I love that bomber jacket, the color is so different and looks great with the camel colored mules! Thanks for sharing, beauty, and I hope you had a relaxing evening after your busy day! I absolutely love the jeans, you look so good in them!!! Bold beauty looking too good. Grace up the new iPhone 7 gorgeously! I really need to try a pair of these jeans! I love the frayed hem and length! They look SO fab on you too! This little crop kick flare with the rough hem is SO good- I love it, babe! Such a great put to gather outfit. You look absolutely gorgeous Kelly! have a lovely weekend. I love how you incorporated that jacket with this look! And the raw hem jeans is love! The top is so cute and perfect for summer! Thanks for this good blog post !! !